Research on human judgment and decision making has been strongly guided by a normative/descriptive approach, according to which human decision making is compared to the normative models provided by decision theory, statistics, and the probability calculus. A common empirical finding has been that human behavior deviates from the prescriptions by normative models--that judgments and decisions are subject to cognitive biases. It is interesting to note that Swedish research on judgment and decision making made an early departure from this dominating mainstream tradition, albeit in two different ways. The Neo-Brunswikian research highlights the relationship between the laboratory task and the adaptation to a natural environment. The process-tracing approach attempts to identify the cognitive processes before, during, and after a decision. This volume summarizes current Swedish research on judgment and decision making, covering topics, such as dynamic decision making, confidence research, the search for dominance structures and differentiation, and social decision making. Contents: P. Juslin, H. Montgomery, Introduction and Historical Remarks. Part I:Judgment and Decision Making in an Environmental Context. B. Brehmer, Reasonable Decision Making in Complex Environments. A. Jansson, Goal Achievement and Mental Models in Everyday Decision Making. 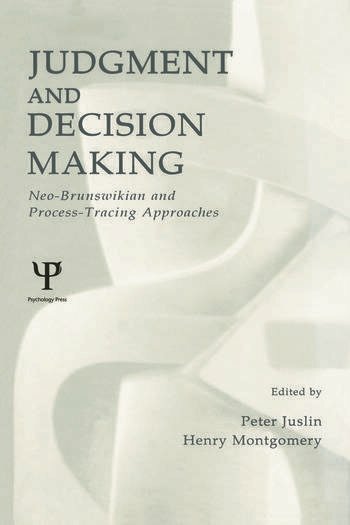 G. Rigas, B. Brehmer, Mental Processes in Intelligence Tests and Dynamic Decision Making Tasks. P. Juslin, H. Olsson, Computational Models of Subjective Probability Calibration. A. Winman, P. Juslin, "I Was Well-Calibrated All Along": Assessing Accuracy in Retrospect. Part II:Judgment and Decision Making as Mental Processes. C.M. Allwood, P.A. Granhag, Feelings of Confidence and the Realism of Confidence Judgments in Everyday Life. H. Montgomery, H. Willén, Decision Making and Action: The Search for a Good Structure. O. Svenson, Differentiation and Consolidation Theory: Decision Making Processes Before and After a Choice. T. Gärling, N. Karlsson, M. Selart, The Role of Mental Accounting in Everyday Economic Decision Making. L. Sjöberg, Attitudes, Values, and Opinions: Models and Dynamics. Part III:Judgment and Decision Making in a Social Context. A. Biel, D. Eek, T. Gärling, The Importance of Fairness for Cooperation in Public-Goods Dilemmas. M. Selart, D. Eek, Contingency and Value in Social Decision Making. S. Hemlin, (Dis)Agreement in Peer Review. Part IV:Commentaries. K.R. Hammond, Mats Björkman and Swedish Studies of Judgment and Decision Making. B. Fischhoff, Well-Calibrated Claims About Difficult Questions. "This book is rich in ideas, and arguments from evidence to conclusions are generally cogent....one thing is clear; by stepping beyond the rigid strictures of a context-free, idealized rationality, this book sheds light on behavioral situations where no social scientist nor decision theorist has yet displayed either the insight or the courage to specify normative conduct. Work like this contributes to the naturalization of J/DM (judgment and decision making) theory, making it ever more continuous with the rest of cognitive psychology." "The volume certainly is not of interest to Swedish researchers only. As the American contributors Kenneth Hammond and Baruch Fischhoff point out in their closing chapters, Swedish JDM research is well known and appreciated far beyond Sweden....The volume contains original chapters and no reprints of previously published articles. It is well written, and leaves the reader impressed by the standard of Swedish judgment and decision-making research. Indeed, this evaluation has been put forward eloquently by the two 'outsiders' (Hammond and Fischhoff) in their final commentaries."